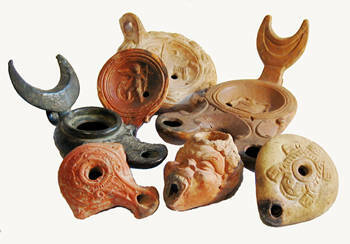 Lamps in pottery and metal made in the area centred by the Mediterranean over a period of some 3,500 years, from the Bronze Age to the Middle Ages, with a primary focus on those of Classical Antiquity. The objects reflect the influence of Greek, Hellenistic, Egyptian, Levantine, Roman, Byzantine, Islamic and other cultures. Visitors are welcome to download and re-use images for non-commercial use. Acknowledgement to the RomQ Reference Collection would be appreciated. Copyright © 2006 RomQ. All rights reserved.